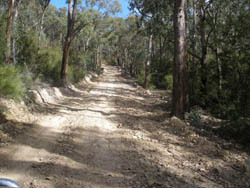 The track runs along Hi Tree Extension Road where it would be classed as easy. Predominently clay / gravel base with nothing too extreme. Further along, it follows an un-named track which eventually joins up with Stoll Road. This un-name section of track has some steep ascents / descents and some awkward grader hills or mounds ( not sure what they are called ) across the track. Easy in the dry, would be a bit more difficult in the wet.